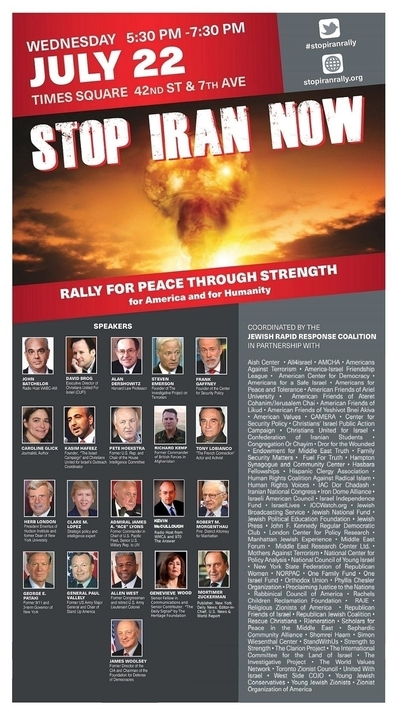 July 22, 2015 – New York City – The “STOP IRAN RALLY,” the largest, grassroots bipartisan American protest against the deal granting Iran a fast track to a nuclear bomb, will be held in Times Square on Wednesday, July 22, from 5:30 to 7:30 p.m. Thousands of Americans from all faith traditions, political interests and communities, including Christians, Muslims, Jews, registered Democrats and Republicans, LGBT, Iranian-Americans, and others will demand that Congress vote down the Iran deal. Under the umbrella of the STOP IRAN RALLY COALITION, more than 100 organizations spanning the nation’s political, religious and social spectrum will participate. A roster of preeminent experts from senior levels of the military, government, academic, and media establishments will speak at the rally. “Strip away the administration’s rhetoric and it’s clear this deal gives the Mullahs – the world’s foremost sponsors of terrorism, $150 billion in return for effectively nothing: no dismantlement of Iran’s nuclear program; no anytime or anywhere inspections; no eradication of Iran’s ballistic missile program; no maintenance of the arms embargo; and no halt to Iran’s sponsorship of terror,” said Jeffrey Wiesenfeld, STOP IRAN RALLY’s co-organizer. “The President publicly asserts that the U. S. ‘will maintain our own sanctions related to Iran’s support for terrorism, its ballistic missile program, and its human rights violations.’ In reality, this deal removes the most severe terrorist sanctions in place against Iran for years; it removes the embargo on weapons sales to Iran against the explicit warnings of our own Secretary of Defense and head of the Joint Chiefs of Staff; it allows for Iran to continue developing its intercontinental ballistic missile program that can only have one mission – attaching nuclear warheads; it provides Iran with billions of unfrozen assets that Iran will surely pour into worldwide terrorism as it has done for 30 years; and it shamefully decouples any linkage to Iran’s continuing imprisonment of an American Marine and four other American civilians not to mention its brutal suppression and execution of its own dissidents. The STOP IRAN RALLY is coordinated by the STOP IRAN RALLY COALITION, a grassroots movement of volunteer citizens, in partnership with more than 100 organizations spanning the entire political, religious and social spectrum. More information can be found at www.stopiranrally.org. Follow updates about the rally on Twitter @stopiranrally and #stopiranrally. Wednesday, July 22, 2015 from 5:30 to 7:30 p.m.